PARIS: Ivan Lendl might be “way too busy” to be his mentor but Tomas Berdych has not given up the dream of jumping on the “super coach” bandwagon. If he needs any pointers on how to carve out a successful coaching relationship with a grand slam champion, the players’ lounge at the 02 Arena is the place to be during the ATP World Tour Finals which start on Sunday. Should Berdych decide to hang out in the area, he could find the place buzzing with the presence of no less than five “super coaches”. Three years after Andy Murray pulled off a coup by hooking up with eight-time grand slam champion Lendl, the super coach seems to have become a “must-have” accessory for many of the top players. Eighties rivals Boris Becker and Stefan Edberg have become familiar sights in the locker rooms after they were lured back into the day-to-day grind of Grand Slam tennis by Novak Djokovic and Roger Federer respectively. Goran Ivanisevic and Michael Chang will also be in London to oversee the progress of ATP Finals debutants Marin Cilic and Kei Nishikori, while Murray’s “chosen one” is now Amelie Mauresmo. 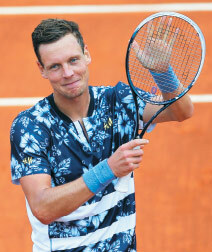 Berdych’s desire to draft in Lendl to his coaching set-up was an obvious one — with both hailing from the Czech Republic — but the man who guided Murray to Olympic glory and two grand slam titles simply could not commit to a full-time job with the world No 7. “We had a meeting when I got back from Shanghai. It didn’t work out because Ivan decided he’s not able to give the full amount of the weeks that he would like to give,” Berdych told Reuters in an interview in the run-up to the season finale.